Galerius, (full name: Imperator Caesar Gaius Galerius Valerius Maximianus Augustus) a native of Illyria, was made Caesar on March 1, AD 293, by Diocletian, whose daughter Valeria he married and who in turn adopted her husband. The latter began his career as an illiterate shepherd, was a man of violent character, fond of pleasure and politically insignificant; but he was an efficient soldier and a loyal and devoted henchman of Diocletian. When about this time the latter divided the empire between the two Augusti, Diocletian and Maximinian, and their two Caesars, Galerius received the countries on the Danube. His official residence was at Sirmium, but he was especially active in the East, Diocletian's share of the empire. From 293 to 295 he conducted campaigns against the Germans on the lower Danube and defeated them repeatedly. On the other hand, he was vanquished at Carrhae by the Persians, who under King Narses had invaded the Roman territory. He retrieved himself, however, in a second battle to such good purpose that he forced a treaty which gave the Romans the greatest expansion of empire they ever secured in the East. To Galerius are ascribed the four edicts against the Christians published after 303 by Diocletian, who was himself a strong believer in the heathen superstitions. The Christians had been constantly increasing, both among the soldiers and the civil officials. Magnificent churches were being erected in the large cities, and the time seemed not far distant when the new religion would gain the ascendancy over the old. Christianity had, therefore, to be rooted out, the Holy Scripture abolished, the churches destroyed, and the cemeteries confiscated. The Christians themselves were degraded to the condition of pariahs. The edicts, ever increasing in severity, were enforced much more strictly in the East where Galerius was in command than in the West. It was in the East that the decisive struggle between paganism and Christianity was fought out. When Diocletian voluntarily abandoned the imperial throne at Nicomedia in May, 305, he named Galerius his successor. The latter thenceforth passed most of his time in Illyricum. Constantius Chlorus, the Caesar in Gaul, who was older than Galerius, was really his superior in mental gifts. At the death of Constantius in 306 the soldiers in Britain proclaimed his son Constantine, Imperator and Caesar; consequently, Galerius was forced to recognize him. 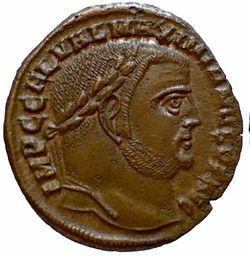 When Maxentius, son of the retired Emperor Maximian, and son-in-law of Galerius, had been chosen Caesar by the Senate and the Praetorians, dissatisfied with Galerius's extension to Rome of provincial taxation, the latter led an army against Rome to uphold the partition of the empire as ordained by Diocletian. But some of his troops deserted him, and Severus, whom he had appointed ruler of the Western Empire with the title of Augustus, was killed at the instigation of Maxentius. Meanwhile, at Carnuntum Valerius Licinianus Licinius, a countryman and friend of Galerius, was proclaimed Caesar of the Western Empire. Nevertheless, Galerius was unable to master the situation either in Italy or the East, and never attained the supreme imperial dignity which Diocletian had held. One part of the empire after the other rebelled and became autonomous. He finally ceased his persecution of the Christians, for the sanguinary character of which he was personally responsible; it had lasted eight years and had disgusted even the pagan population. Menaced by the alliance between Constantine and Maxentius, he issued an edict 30 April, 311, in Nicomedia permitting the Christians to practice their religion without let or hindrance. A few days later Galerius died on the Danube. The Christian authors of his time, Lactantius in particular, condemned him violently as the author of the last great persecution of the Christians. This page was last modified on 5 March 2019, at 18:00.